In the mid-16th century, when Spain sent its first scientific explorers to Mexico, Francisco Hernandez reported seeing a lizard squirt blood from its eyes. Horned lizards — found primarily in Mexico and the American Southwest. Imagine a horned lizard — fat and brown with horns pointing from the back of its head — sitting in the sand. It sees a fox approaching. The lizard sits still, hoping the fox won’t be able to distinguish its brown skin from the sand. But the fox sees the lizard and pounces! Its teeth clamp down on the lizard’s spiny head. Then the lizard does what only a few other lizards can do — it squirts blood from its eyes. The blood tastes horrible — and the fox drops the lizard in disgust. Horned lizards have been around at least fifteen million years. But today some are disappearing. Fire ants are edging out their preferred food — big, red “harvester” ants. And fire ants have given all ants a bad name. So people are using more pesticides to kill ants — and horned lizards are going hungry. Horned lizards are slow, fat and they multiply quickly. They sport horns and spines along their backs. They eat mostly ants. Ants are mostly made of chitin. To get enough energy, a horned lizard has to eat them in large amounts — over 200 ants a day. And this is one reason why a horned lizard is so fat and slow — it has a huge stomach. To natives of North America — such as the Anasazi, the Hopi, the Navajo, and the Zuni — the horned lizard is a symbol of strength. But now the horned lizard is struggling to survive. Much of the decline is due to the destruction of the lizards’ natural habitats by humans. But another key culprit — especially in Texas — is the fire ant. This ant species was accidentally introduced from South America several decades ago. Fire ants out-compete and eradicate the lizard’s primary food source — big, red “harvester” ants. Yet fire ants — with their different nutritional content — aren’t a good substitute food for the lizards. What’s more, fire ants have given all ants a bad name — because they’re aggressive and have a worse bite than native ants. So in recent years, people have used more pesticides to kill all ants — and horned lizards are finding it harder to get a good meal. 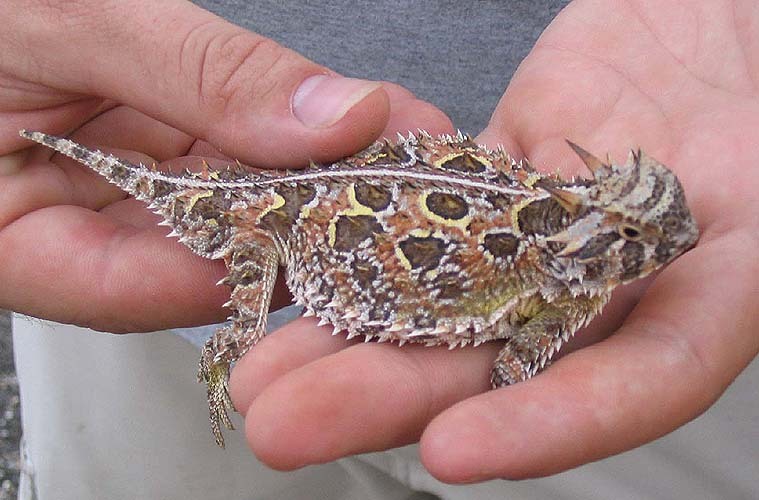 So the Texas horned lizard is no longer found in about a third of its geographic range. Warm Blooded or Cold Blooded? Q. Why have these lizards practically disappeared in Texas? A. 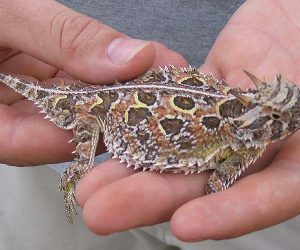 “It’s primarily human induced impact (in my opinion) that is responsible for the horned lizard decline in Texas — and that means habitat loss (mostly). In Texas, it’s the conversion of habitat to agricultural land and urban areas. In the 1920s and 1930s, agriculture didn’t have such a big impact on lizards. People used to work in cotton fields and they would find the horny toads. They did the work by hand. But after WWII, there was a shift, people relied more heavily on mechanized agriculture and pesticide use. So this new type of agricultural activity had a bigger impact on the lizards.